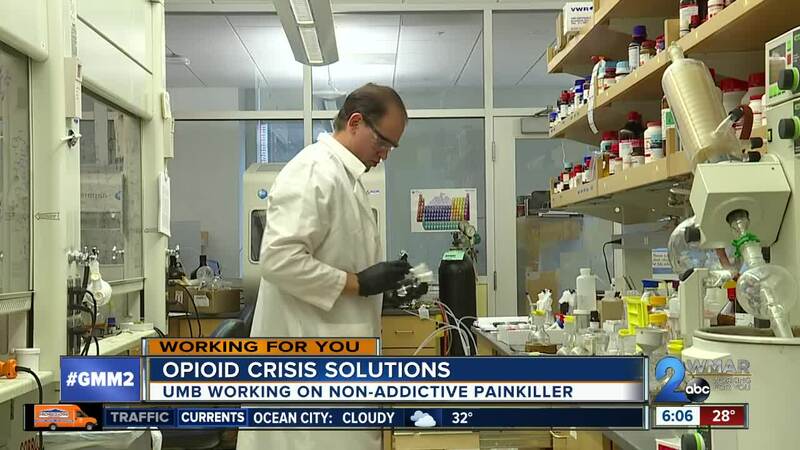 Powerful painkillers may no longer be off limits to people living with addiction, at least that’s the hope of one local doctor conducting research at the University of Maryland Baltimore. BALTIMORE — Powerful painkillers may no longer be off limits to people living with addiction, at least that’s the hope of one local doctor conducting research at the University of Maryland Baltimore. Legally prescribed, as well as illegal opioids, account for more than 2,000 deaths last year in Maryland. If any other product were known to kill so many of its users, it’s likely it would be removed from the market. But those staggering statistics partly inspired one local doctor to improve a patient’s odds with a new type of painkiller. A solution to a nationwide epidemic and dependence on opioids could be found in a lab at the University of Maryland Baltimore. "If we’re treating cardio vascular disease, we just don’t say cardio vascular disease, we need to know specifically what the issue is so that we can target drugs that hit the specific issues, and that’s what I’m doing with my research here," said Dr. Andrew Coop, a University of Maryland Baltimore professor of Pharmaceutical Sciences. The issue with opioids is the drug can be highly addictive for some, or create an incredible high for others. "I’m looking at can we design an analgesic that will treat the threshold of pain of opioids because it does treat a higher threshold of pain than Advil, but doesn’t lead to either of these effects," said Dr. Coop. Researchers at Maryland universities are combating the opioid crisis by finding ways to stop addiction before it starts. Dr. Coop calls his latest effort UMB 425. "We have a compound designed, that at least in mice and rats, does indeed give the analgesic effects similar to morphine, but doesn’t cause the dependence." It’s become a competition among doctors to create a powerful new painkiller, one that could destroy pain like an opioid but without any of the harmful side effects of withdrawal or dependence. "We’ve all got slightly different approaches, I would love that I get the drug to market but it’s not about me, I just want one of us to get the drug to market," explained Dr. Coop. Dr. Coop's hope is that the drug comes sooner than later. "I’ve been working on this for 20 years, it’s taking me 20 years to get to UMB 425, I’m hoping it doesn’t take me another 20 years to remove the reinforcing because if we count up how many potential live we’re going to lose, it’s horrendous." None of the experts or researchers we spoke with are calling for an all out ban on opioids. Since the 1970s, the FDA has only banned one opioid and asked a manufacturer to recall its version of the drug. WMAR-2 News reached out to the FDA to talk about what it’s doing to stop the opioid epidemic, but a spokesperson declined to make anyone available to talk on camera.